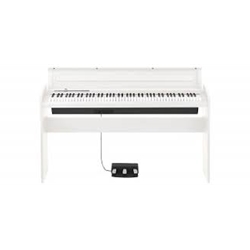 Korg LP-180 - White 88-key Digital Home Piano with 10 Sounds, 120-note Polyphony, Three-pedal Unit, and Natural Hammer Weighted Action Affordable Playability at Home Korg's LP-180 digital home piano in white is the perfect combination of playability and affordability that MAE pianists desire. Combining the authentic feel of natural, weighted hammer action and brilliant piano sound from Korg's SP170S with the style and form of their LP-380 gives you an instrument you'll use for family sing-alongs for years to come. Choose from 10 sounds including natural - sounding pianos, organs, and strings. On-board speakers or dual headphone jacks let you decide if you want to be heard or keep things to yourself. Bring some music into your home with Korg's LP-180 digital home piano. Korg LP-180 Digital Home Piano at a Glance: Feels and plays like an acoustic piano Sounds and versatility for your home piano Designed to suit modern family life Feels and plays like an acoustic piano The biggest factor in purchasing a new piano is playability. The LP-180's weighted hammer action feels like a real grand piano under your fingers for a satisfying playing experience. The included three-pedal unit gives you control of damper, soft, and sostenuto, so you'll enjoy the same expressiveness that you have with an acoustic piano. Sounds and versatility for your home piano Another important consideration in picking a new home instrument is sound. The 120-note polyphony gives you a full, natural representation of included 10 sounds. The LP-180 gives you something you don't get with an acoustic piano: built-in chorus and reverb effects that give you the ability to shape each sound. Use the MIDI output to access sound patches from a standalone module or interface with a computer and use the LP-180 as a controller for your virtual instruments. Selectable velocity with the Key Touch Control function lets you tell the piano how to respond to you and your playing style. Designed to suit modern family life When you're buying a piano for your home, you want one that will fit not just your musical needs but your lifestyle. The slim and stylish design of the LP-180 blends easily into any decor. Take advantage of the onboard speakers by gathering the family on holidays and celebrating with song. If you have younger players taking lessons, they'll be able to plug in headphones - shutting off the external speakers and letting them focus on their practicing. If you're having everyone over for a jam, just use the headphone outs and go straight into a PA or an amplifier. The integrated cover keeps your keys safe and clean when you aren't playing. Korg LP-180 Digital Home Piano Features: 88 keys with natural hammer-weighted action and three-pedal system give you acoustic playability 10 sounds with 120-note polyphony for natural-sounding instruments Dual headphone outs for lessons or use them as audio outputs for an amplifier MIDI out gives you controller use for accessing external sound modules/virtual instruments Integrated key cover protects when you aren't at play Stand included (no bench included) The modern home piano is the Korg LP-180! Tech Specs Number of Keys	88 Number of Voices (Sounds)	10 Polyphony	120 Voices Number of Effects	2 Effects Types	Reverb, Chorus Song Playback	10 Number of Speakers	2 Amplifier	11W x 2 Number of Audio Outputs	2 Audio Output Types	2 x 1/4" MIDI I/O	Out Number of Pedals	1 w/ Damper, Soft, Sostenuto Pedal Inputs	1 Height	30.75" Width	53.74" Depth	10.79" Weight	51.37 lbs.